MOST IMPORTANTLY, MAKE MEMORIES TOGETHER! 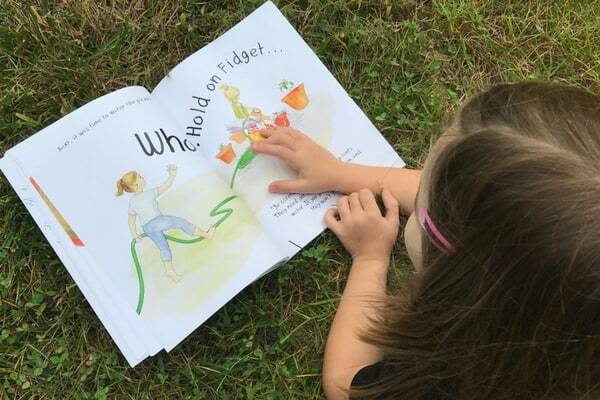 After you’ve read the book, pull out Fidget’s themed educational and fun activities to complete together. There are projects to do like pizza garden growing activities, pizza making fun. educational pages to foster the love of learning and games to play. Fidget’s themed learning activities encourage science, letter recognition, writing, number recognition, introductory math concepts, simple math problems, fun games and more. The Fun Pack is great for preschool and kindergarten aged children. What's in the Fidget Fun Pack? • A downloadable 36 page e-book of Fidget’s themed educational Pages. • BONUS! Also included, 9 pages of Fidget themed GAMES! • 2 Memory matching games. There is a more complex version with detailed pictures and an easier version with simpler pictures to match. Cards can also be mixed together for a more deluxe game once they are mastered alone. • Fidget themed Tic-Tac-Toe boards and play pieces. • A pizza themed counting game. Grab Your Copy Today and Let the Fun Begin! BONUS! When we mail out your copy of FIDGET we'll send along a printed copy of the 9 pages of GAMES! BONUS: 9 pages of Fidget themed GAMES! Are you an Educator? Or, a Librarian? We have an educational Fidget Fun Pack created specifically for schools and libraries. What’s in it? 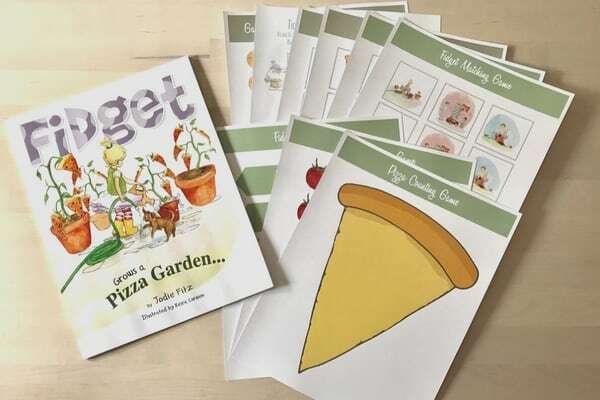 A downloadable educational e-book filled with activities that accompanies the story of 'Fidget Grows a Pizza Garden'. 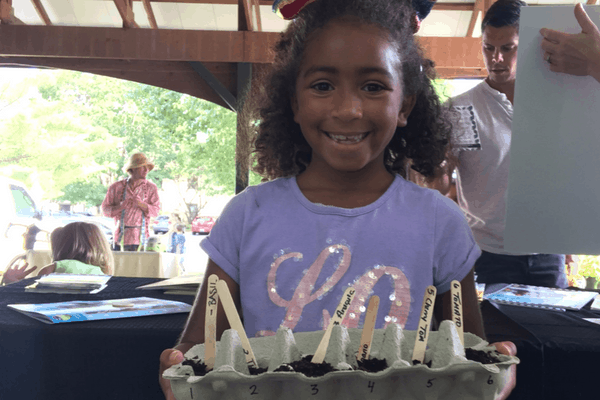 Lesson plans include garden planting activities, recipe making activities, fraction learning and more. 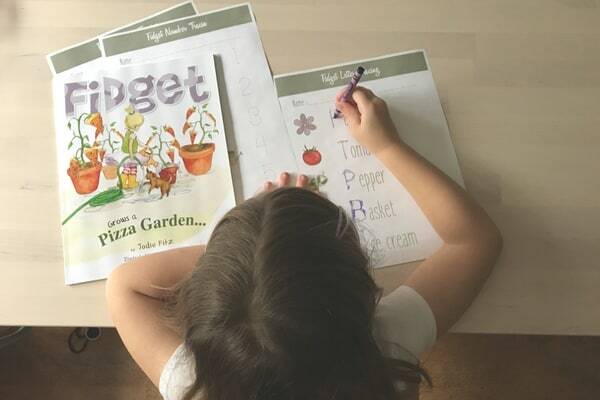 Downloadable educational support materials that make your Fidget Fun activities easy; pizza planting activity materials (plant labels, watering charts, shopping lists, etc), apron iron on design, recipe cards, sauce labels, fraction activities and more. Download Your Kit for $12.99! Need a Tax-Free option to pay or need to pay by check? Just contact us here with your id number and we can process that for you. Interested in having Jodie come to your school or library for a visit? Find out more info on author visits for libraries here or schools here.